I was attending a conference about green purchasing in fourth week of October taking place in Suwon, South Korea and pondering about what the substance of the conference would bring impact to the IT field. 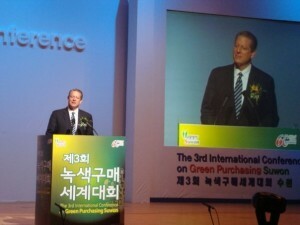 The conference theme was about green purchasing, a term coined to refer to purchasing of sustainable products. Despite the seemingly simplistic definition, the idea of the green purchasing actually has been attracting wider audience as these days concern about life sustainability on planet earth has been growing more rapidly. The conference was organized by International Green Purchasing Network (IGPN), an organization which promotes green purchasing across the globe. It was sponsored mainly by the Korean government and some UN committees. Former US president Al Gore who was awarded as Nobel peace prize laureate in 2007 was invited to deliver the keynote speech. He spoke about the importance of living green to sustain the environment and do our work in ensuring that future generation would still be able to live on earth conveniently. He mentioned that climate change is a real issue and should be addressed through fast-paced global collaborations. The temperature rise issue, melting arctic ice issue, and some other environmental severance issues are wake-up calls to governments, companies, and also to individual consumers to take care more the behavior in living. Therefore, purchasing goods through green purchasing method is one of the methods an individual, company, or organization can contribute. This entry was posted in Miscellaneous on October 31, 2009 by Tech Admin.